Worried members wedge themselves into TelexFree’s broom closet in Marlborough, Mass, Tuesday. Source: YouTube. UPDATED 12:15 P.M. EDT (U.S.A.) The Boston Red Sox were at the White House Tuesday to receive recognition for winning the 2013 World Series. 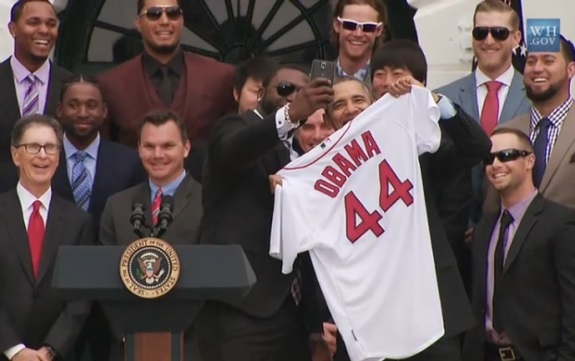 There were plenty of smiling faces, perhaps particularly when slugger David Ortiz, the MVP of the series, posed for a selfie with President Obama. But back home in Massachusetts, particularly in Marlborough, specifically in the stylized broom closet the MLM delusion merchants call TelexFree “corporate” as part of a long-running linguistic conspiracy to sanitize HYIP Ponzi cesspits, smiles were absent. In fact, the police were dispatched to prevent things from getting out of hand. That’s because too many unhappy and confused TelexFree members who appear to believe they’ve been duped by the firm and its stable of serial delusion merchants wedged themselves into the broom closet to demand answers about why TelexFree either wasn’t paying them or why only certain members were getting paid. Our guess is that they work in staggered shifts, given the size of the office. All seven showing up at one time would appear to create sardine conditions. According to the Tennessee filings, TelexFree’s two corporate officers are James Merrill and Carlos Wanzeler, who also own something called “Clarity Communications.” It’s unclear whether TelexFree’s seven employees also work for Clarity and several other firms associated with TelexFree. Merrill is in charge of the money at TelexFree and has the ability to “motivate and instill trust in a company,” according to the Tennessee filings. So, a company affiliates say has global reach, has gathered $1 billion and has the responsibility to pay hundreds of thousands of affiliates, does it all with just seven workers and owns another company called Clarity and several other firms. And when unhappy affiliates show up in the broom closet to demand answers . . . well, there isn’t a whole lot of wiggle room to begin with. The issue here is almost certainly about margins — not only in Tennessee, but in other states — and whether TelexFree can squeeze any profits after it pays for everything else. This question leads to questions about why so many TelexFree affiliates seem to believe they’ll prosper through TelexFree. To put this in context, imagine that any presumptive TelexFree telephony competitor in a low-margin business had put additional pressures on itself by suggesting that $289 sent to the firm would return $1,040 in a year and that $15,125 would return $57,200. This is an epic problem for TelexFree. For starters, the returns are absurd on their face and bring issues such as Ponzi scheme, pyramid scheme, the sale of unregistered securities and securities fraud into play. Moreover, TelexFree relies on banks to conduct business. And yet no legitimate bank ever would assert that a deposit account would provide such a whopping return. Even so, TelexFree affiliates effectively say the company outperforms its own banking vendors by orders of magnitude. The same company now mysteriously says it is branching out into credit repair, something that potentially makes it a nemesis of the same banks its uses as vendors — while affiliates claim banks are laggards when it comes to producing income, a proposition that leads to questions about why banks haven’t followed TelexFree’s lead in recruiting affiliates and guaranteeing returns that would make Bernard Madoff blush. At the same time, filings in Washington state show that TelexFree LLC, a Nevada entity, had made intracompany loans to other TelexFree businesses — and had more than $18 million parked at Fidelity Investment. Why does TelexFree have any money parked at Fidelity when, according to affiliates, it can earn 347 percent in a year “guaranteed” by investing in itself? Where did affiliates get these ideas? Well, from TelexFree itself. In a “Be our promoter” pitch that once appeared on its own website, TelexFree told the troops to send in $299 (the sum also has been reported as $289) and start receiving $20 a week for a year. Meanwhile, TelexFree had an in-house scheme in which it entitled itself to 20 percent of affiliates’ earnings at the end of a year, something that became the subject of affiliate complaints. As the PP Blog reported on Nov. 17, 2013, at least some TelexFree affiliates were told at a company event in Orlando that the 20 percent payback requirement had been waived. But the requirement appears not to have been lifted. The logistics of collecting 20 percent from each affiliate on a worldwide basis raises questions about whether some TelexFree rainmakers received secret deals that included no payback requirement (or payback discounts) and whether the company structured transactions or relied on a hidden money-moving system to evade bank-reporting requirements when policing up cash from affiliates, whether they received a waiver/discount or not. Here we’ll point out that the Zeek Rewards MLM Ponzi scheme ($850 million) and the AdSurfDaily MLM Ponzi scheme ($119 million) both made sweetheart deals with insiders. Like Zeek, TelexFree has a purported “advertising” component in which members purportedly get paid for posting ads online. At 1.5 percent a day, Zeek promised to pay the most. On an annualized basis, TelexFree and ASD are in the same ballpark. Zeek and TelexFree members purportedly get (or got) paid for posting ads. ASD members purportedly got paid for clicking on ads. The concern with TelexFree — as was the concern with Zeek and ASD before it — is that its “product” is just a front to mask an investment scheme. As this Blog has pointed out many times, HYIPs are all about incongruity. Tuesday, however, set a new standard for irreconcilable images: cops and citizens potentially in harm’s way in an MLM HYIP broom closet. Officers appear not to have known that TelexFree is under investigation by the Massachusetts Securities Division. Nor do they appear to have known that TelexFree is under investigation in Brazil and that a judge and a prosecutor reportedly have been threatened with death. 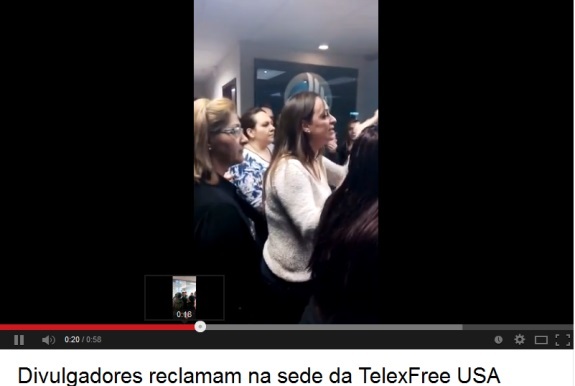 Nor do they appear to have known that TelexFree affiliates in Brazil have staged protests in support of the company, something that was the exact opposite of what occurred in Massachusetts on Tuesday. Our conclusion from observing videos of the broom-closet debacle is that TelexFree, now fueling tensions in the United States and creating worries about economic security after gorging itself nonstop at the 24/7/365 Portuguese and Spanish buffet it created and potentially hoping to establish an Asian smorgasbord, poses a risk to public safety. Today we call for the Massachusetts Securities Division to brief police. And we call on TelexFree affiliates in Greater Boston and the whole of the state to remain calm and to steer clear of the broom closet occupied by a company that might have put $1 billion on the table. As righteous as your anger is, your answers are not there. Rather, they are within the part of you that knows an annual return that beats Madoff on the order of 30 to one is too good to be true, that knows the videos and artwork online that suggest TelexFree is much bigger than a broom closet were deliberately designed to deceive, that the “private jet” and monster SUV and other shiny props were cynically calculated to reinforce your dream before cruelly destroying it. Police did a good job of easing Tuesday’s tensions. And videos made by TelexFree affiliates suggest that reason was the order, not the exception. So, hats off to both the police and duped affiliates for exercising restraint. We urge affiliates to see TelexFree “corporate” for what it is: the stylized broom closet used by a company that is not paying you after renting ornate hotel accommodations in Madrid, staging the entrance of limousines, posing with giant SUVs, shuttling top recruiters around on a “private jet,” dangerously pandering to the masses in Brazil and Portugal and even sponsoring a professional soccer team in South America. President James Merrill did not want to talk about how much money the Botafogo club in Brazil received, but every penny of it almost certainly came from affiliates who suddenly now aren’t getting paid and are being told to go out and rope in five more suckers. Say no. Avoid TelexFree “corporate” and any fellow member who calls it that. If you are concerned, call the FBI. Call the SEC. Call the Massachusetts Securities Division. Republican or Democrat, right, left or in between, write to President Obama and tell him his 2009 message about domestic and offshore frauds and corporate broom closets was slow to sink in — but that now you understand it because you’ve encountered one up close and personally. In fact, some of you were in the TelexFree broom closet — with police. One more note: a Brazilian concerned citizen put together an impressive dossier on the link among Sann Rodrigues, Carlos Costas, Charles Wanzeler, and James Merrill back in 2013. It’s in Portuguese, but it’s quite readable through Google translate. As the PP Blog reported on Nov. 17, 2013, at least some TelexFree affiliates were told at a company event in Orlando that the 20 percent payback requirement had been waived. I believe that little ditty can be credited to Mr. Labriola who seems to often times eat his shoe for lunch. Wonder how many people that influenced to join and then as the year ended were “surprised”!!! !